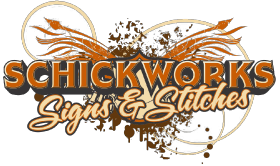 At Schickworks, everything we do is custom to your exact needs and specifications. With a focus on fast and courteous service, you can expect a great experience. Whether you are looking to purchase promotional apparel or an exterior sign for your business, we’d be happy to help. Contact us today to learn more about our products and services. Come in to Schickworks Signs & Stitches’ store in Williams Lake and get ideas for promotional products. Try on different styles and colours of wearables. See our new wall design ideas. We have apparel suitable for the entire family with men’s, ladies’ and children’s sizes available. You can also see some of our many sandwich boards, wall designs and neon signs on display. Please feel free to contact our store with any questions you may have about our service and selection. We look forward to seeing you or hearing from you!